"Life in the Past Lane"' was the ninth episode of the fifth season of Daria (episode number 509). It first aired on MTV on May 28, 2001. "Life in the Past Lane" was written by Anne D. Bernstein. On a jaunt down Main Street with Daria and Tom, Jane spies a good-looking guy enter the office supply store and follows him. There, she strikes up a conversation and he introduces himself as Nathan. He explains that he loves the style and elegance of old-fashioned things, and when Jane concurs, he asks for her phone number. As it turns out, Nathan is really into the whole "swing era" thing, complete with period outfits and visits to speakeasy clubs. Jane starts getting into it as well, even going so far as to dress in period fashions (which she found in the attic of her house), but Daria is openly contemptuous and mistrustful of Nathan, which upsets Jane (possibly because it's a replay of when she met Tom) and caused her to snap that Daria's just jealous becasue she & Tom are in a rut. This bothers Daria, and she decides to go on a date with Tom somewhere new; unfortunately, that new place is a terrifyingly cheery restaurant and they flee. Meanwhile, Upchuck is busy demonstrating his prowess at magic and sleight of hand, with occasional help from Mr. DeMartino (who plays the shill to help scam the ever-gullible Mr. O'Neill). When he demonstrates the old "tear the money to pieces and magically restore it" trick to the Fashion Club, only Stacy is intrigued -- no, make that obsessed, and yearning to know how it's done. Upchuck promises to bring her into the fold, in return for her assistance on the ultimate magic trick, and she agrees (though secretly, as she would be risking her standing in the Fashion Club otherwise). Back on the Nathan front, Jane manages to convince Daria to give the guy a chance, and she agrees to a double-date with them. On the way to their destination, she and Tom strike up a conversation with Nathan, who slowly starts to demonstrate that he may be a little too into the whole swing thing, though Jane still doesn't seem to realize it. Even though the date (to an abandoned drive-in theater for a get-together with other swing couples) is a bust for Daria and Tom, she decides to keep her opinions to herself for Jane's sake, and even agrees to give the guy another chance when Jane buys four tickets to Upchuck's big magic event. Unfortunately, when Nathan comes to pick Jane up, they get into a fight over Nathan's overly obsessive behavior -- Jane saying it's just a fad and all she wants to do is have some fun, while Nathan insists that it's not just a fad but a way of life -- and his controlling nature, as he pressures her on her clothes and to hang out with his crowd over hers. Fed up, Jane snaps that "if you really liked me, it wouldn't matter if I was wearing fishnets or sweatpants!" At the magic show, the Fashion Club is horrified to discover that Upchuck's assistant is none other than Stacy, who helps him with the "escape from the air-tight trunk" trick. Unfortunately, the trick goes awry when Stacy appears to forget what to do after locking Upchuck in the trunk, and while Ms. Barch and Mr. DeMartino attempt to free him, Stacy breaks into a crying fit. Sandi then smugly lords it over her... until Stacy reveals that she was only acting, and Upchuck appears at the top of the auditorium stairs moments later! The crowd applauds, Quinn and Tiffany are impressed, and Sandi is left to stew in her own juices once again. In her interview with Kara Wild, Anne Bernstein says that she was very much involved in swing dancing culture when she wrote "Life in the Past Lane," saying "[i]f you are into swing/retro culture, you will get the subtle nuances." Jane again makes barbed jokes about Daria and Tom's relationship, joking "if I didn't pick up perfect strangers, you wouldn't have a boyfriend". This time, Daria lands one back by asking "will I have to date this guy too?" (offending Tom) and Tom later makes a joke about Nathan being Daria's future boyfriend (offending Daria). This is one of three episodes, "See Jane Run" and "The F Word" being the others where Jane doesn't have her usual offset hairdo for the complete duration of the episode. In his praise for Daria as his favourite series of all time, Doug Walker said that this is one of only three episodes that he didn't like. The other two (Depth Takes a Holiday and Daria!) are more commonly criticised by fans. Brittany, believing that Upchuck can read her mind, mentions thinking about Teddy Wozniak but insists she wouldn't actually do any of the things she was thinking about. Kevin looks at her with obvious disapproval. The tie-in websites revealed that Teddy was a football player for a rival school, no wonder Kevin's annoyed! Jane recalls her relationship with Nathan in the Dariarotica comic Keeping Track of Fantasies by Wouter Jaegers when passing one of the shops that she and Nathan used to go and buy those forties style dresses she wore in the episode, Jane remarks that the dresses looked on her too and wonders how Nathan's doing, what became of him. LongSnakeMoan's "It Felt Like A Kiss" spins out of Nathan's last scene, presenting him as an abusive, controlling boyfriend. 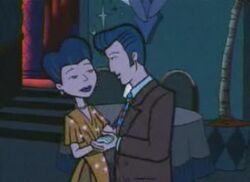 In Peter Guerin's "The Strange Case of the Mystery Girl Patter", Nathan puts in a cameo appearance wearing a zoot suit; Daria points Nathan out when she talks to Quinn about zoot suits. This page was last edited on 6 April 2018, at 15:03.